Easy, quick and reliable party-pleaser. If you like, double the cream cheese and use all of the stems, chopped, in the mixture. Stuff the mushroom caps with half, then serve the rest as a spread. 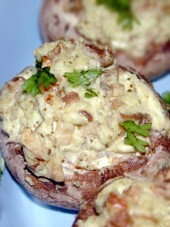 You can also bake this extra cheese mixture as you bake the mushrooms and serve it as a hot dip. Preheat oven to 400 degrees. Gently pull stems out of mushrooms. If the top of the stem breaks off, dig it out with your fingers. Discard about 1/3 of the stems; finely chop remaining stems. Thoroughly combine chopped stems with all remaining ingredients except mushroom caps. Spoon cheese mixture into mushroom caps. Bake about 20 minutes, or until mushrooms are dark and tender and most of the liquid the mushrooms gave off had evaporated (there will probably still be some liquid). Serve hot. This entry was posted on Wednesday, September 5th, 2007 at 2:05 pm	and is filed under Appetizers, Master Recipe Index, Party Food & Snacks, Speed Queen (30 min/less), Vegetarian. You can follow any responses to this entry through the RSS 2.0 feed. You can leave a response, or trackback from your own site.